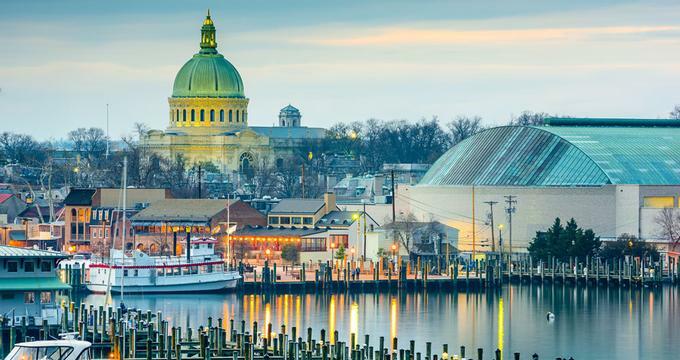 For the past 350 years, Annapolis, Maryland, has been home to merchants from around the world, which has resulted in a diverse selection of shops, art galleries, inns and restaurants in the area. 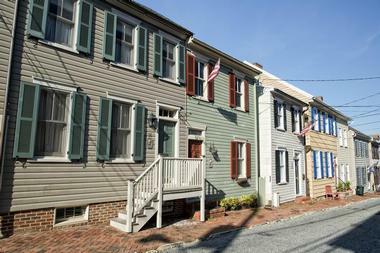 The city center of Annapolis, MD, is full of historic buildings which have been preserved or saved thanks to the civic group Historic Annapolis. A trip to Annapolis is never complete without a visit to the United States Naval Academy. Highlights include naval hero John Paul Jones’ crypt, Noon Formation, where the midshipmen are seen marching in formation to lunch, and the USNA Museum. Musical and theatrical events abound at the Yard, so check the music department’s calendar of events. Guided walking tours are available to the public year round. Midshipmen have a full, rigorous, four year academic calendar, as they prepare to join the Navy or the Marine Corps. The purpose of the naval academy, founded in 1845, is to develop leaders - mentally, morally and physically - to lead the nation in military or civilian life. There are over 6 miles of trails in this 340 acre park, winding through forests and grassy fields for visitors to enjoy. There is a children’s playground, and Quiet Waters Park is on the southwest side of the inlet on the South River, just diagonally opposite the Naval Academy. Six outdoor pavilions can be rented for parties, and the Blue Heron Center, the park’s indoor facility, is available for weddings and other events. 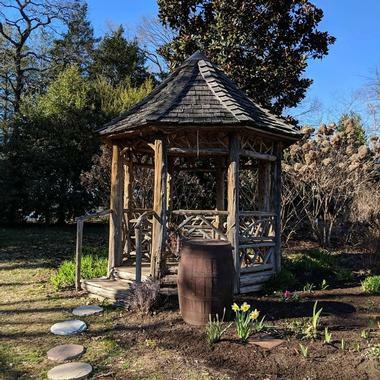 For an outdoor wedding ceremony, there is the South River Overlook, perched above the South River, or the James Lighthizer Gazebo, another lovely setting, on the edge of a delightful pond. Completed in 1779, the Maryland State House is steeped in American history. It is where George Washington came to tender his resignation as commander in chief of the Continental Army in 1783. It also served as the location for the ratification of the Treaty of Paris, which officially ended the Revolutionary War. 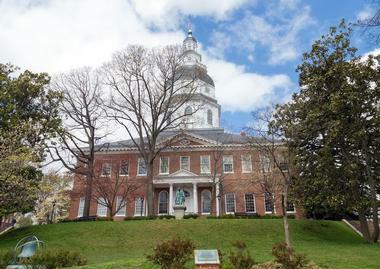 The Maryland General Assembly convenes in the Maryland State House for three months each year, making it the only functioning building from colonial times still remaining. The building is also home to the governor’s office, as well as the president of the Senate and many others public officials. The State House is open to the public every day from 9 am – 5pm, excluding some holidays, and offers self-guided tours. There are numerous memorials and plaques on the grounds, and in 1960 the State House was designated a National Historic Landmark. 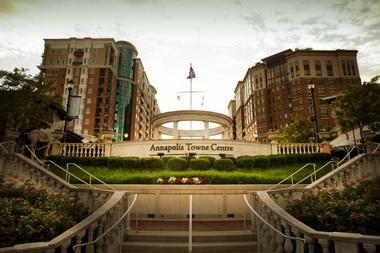 Located less than four miles from downtown is the all in one destination of Annapolis Towne Centre. Essentially, you can drop off laundry, go to the bank, stop for lunch, see a broker, go to a yoga class, buy a new dress and go to a concert, without ever leaving the grounds. There are regular trunk shows, exhibitions of all kinds, concerts, films, plays and lectures on any given day at the Towne Centre. Stores abound, meaning there is something for everyone, from clothing and handcrafted furniture to fine olive oils and eco-friendly pet food. There are several food options as well, whether you want a quick bite or a formal dinner, there are 18 eateries to choose from. 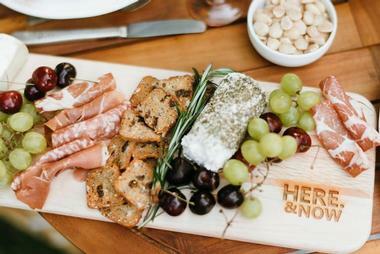 It is also home to one of the largest Whole Foods Market’s in the country. Luxury townhouses, apartments and condominiums are housed in state-of-the-art buildings, as is a 46,000 square foot building for business use. Additionally, 11 well-known hotels are within a short distance. Built in the 1760s by William Paca, this Georgian manor house is recognized today as one of the finest 18th century homes in the country. In 1901, the property was converted into a hotel, and became Annapolis’s finest hotel for decades. Historic Annapolis and the State of Maryland bought the site in 1965 and over the next two decades preserved and restored it to reflect its original 18th century appearance. Author Alex Haley wrote about African American history and tackled the issue of racism in his writing. His Pulitzer Prize winning novel Roots focused on slavery in the United States and tells the story of a slave named Kunta Kinte who was captured in West Africa and sold into slavery. The Kunta Kinte-Alex Haley Foundation has given this Memorial to the City of Annapolis in trust, as a celebration of ethnic diversity and brotherhood everywhere. The Memorial has three parts: The Sculpture Group, Story Wall and Compass Rose. The sculpture group is placed along Chesapeake Bay, with Annapolis port being a symbolic beginning of the journey of Africans to these shores. 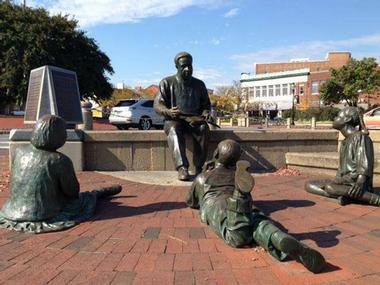 The sculpture depicts Haley holding a book open, sharing his family's history with three children of different racial backgrounds. The Story Wall is made up of ten granite-framed markers topped with bronze plaques, lining the retaining sea wall on Compromise Street. Each plaque is filled with encouraging messages and excerpts from Roots. Across the street from the sculptures is The Compass Rose, a 14 foot in diameter bronze map of the world. Visitors to the compass can stand in the center and face the direction of their ancestor’s homeland. The Hammond-Harwood House displays some of the finest plasterwork, furnishings and woodcarving of all the American colonies. The house was designed by William Buckland, arguably the best Georgian architect of his time. Matthias Hammond commissioned William Buckland in 1774, and the result was his finest work. Stunning portraits grace the walls of the house, particularly notable are those by the great portrait painter Charles Wilson Peale. The most famous of Peale’s paintings is also on display, a portrait of six year old Ann Proctor sitting with a doll in her lap as he painted her 220 years ago. Hammond never lived in the house, but Buckland’s grandson, William Harwood, would live there, and his descendants after him, until 1924. In 1940, the house was purchased by the Hammond-Harwood House Association and it has since welcomed thousands of visitors. Officially open to the public in 1998, this dramatic, modern memorial was designed by New York architect Secundino Fernandez. This four-sided open air memorial is surrounded by a circle of 48 granite pillars, each representing the 48 states at the time of war. In between each pillar and etched in granite are the 6,454 names of all Marylanders who lost their lives in World War ll. Additionally, there are 20 plaques describing war time events and milestones. The memorial also includes two 14 foot in diameter globes which depict the location of key battles in both Eastern and Western hemispheres. 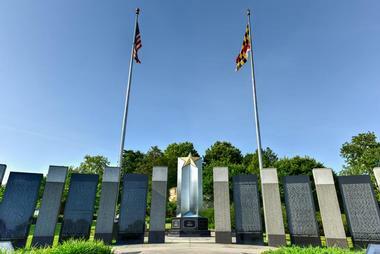 A stainless steel monument, with seven sides to represent Maryland as the 7th state in the Union, is topped with a star that is illuminated each night. Visitors should take their time while exploring this memorial and meditate on the lives lost. The memorial is a stop on the city trolley tour, and on Independence Day, it offers an excellent view of the fireworks. 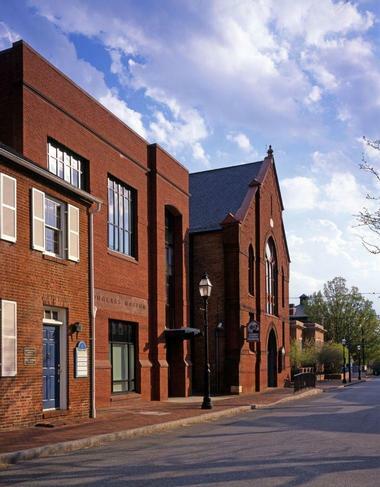 Dedicated to bringing world-class art to Annapolis, the Elizabeth Myers Mitchell Gallery opened its doors in 1989 at St. John’s College campus in Annapolis. 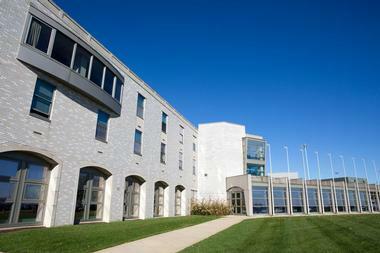 Designed by architect Chip Bohl, this modern building won a Citation of Merit from the American Institute of Architects. For a gallery of its size, it has an astonishing variety of exhibited works, and brings more than 10,000 visitors a year to its exhibits. The Mitchell Gallery serves as a major local source for viewing, studying and appreciating art. Exhibitions have included works of celebrated artists such as Bruegel, Rembrandt, Calder, and Rodin. Docent tours, special events and programs are available, and admission is always free. Annapolis Summer Garden Theatre is an outdoor theatre, creating a performance under the stars every weekend night for several months of the year. Since 2006, all featured shows have been musicals, including many recent Broadway and off-Broadway shows. There are five-week shows, with three showings each weekend day. It is recommended that guests bring a blanket and come prepared for the weather by keep a sweater or umbrella handy. This theatre is a testament to the artistic community of Annapolis. Volunteers created the theatre and still maintain it 50 years later. 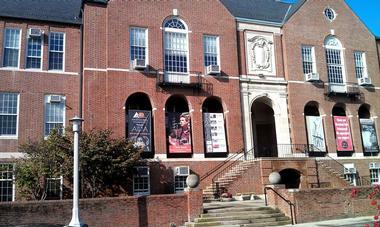 Founded in 1979, Maryland Hall for the Creative Arts is home to the Annapolis Symphony Orchestra. Recent renovations have produced excellent acoustics in its 750-seat auditorium. There are from 5-7 performances each year, with a wide range of classical and more modern acts with José-Luis Novo conducting. Ticket holders are invited to join the conversation at 6:45pm, before each Lexus Classic Series Concert, a free 45 minute discussion about the evening’s program, led by Dr. Rachel Franklin, distinguished lecturer and pianist. These events provide musical, aesthetic and historical context to the evening's program, and are a large part of what sets the Annapolis Symphony apart from other venues. Several outreach programs are done during the year, including an annual concert at Quiet Waters Park. Built in 1875, the Thomas Point Shoal Lighthouse is the last of its kind, and is one of the most photographed lighthouses in the United States. Tours depart from Annapolis, at water’s edge, behind the Annapolis Maritime Museum and all donations go to the upkeep of the lighthouse. The tour of the Lighthouse involves some physical exertion, and a 30-minute boat ride to and from. You may have a guided tour of the interior of the lighthouse and tours are limited to 18 people per boat. Reservations are required, as is a safety video. Guests are advised to plan ahead as there are no toilet facilities anywhere. Since major exterior preservation work has been done, the focus now turns to finishing the interior of the lighthouse. It has been designated a National Historic Landmark, one of only nine lighthouses in the nation to be given that designation. 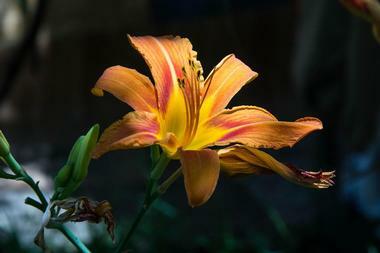 In 1972, artists from the Annapolis Summer Garden Theater created the Annapolis Opera Company. Their search to cast the first show led them to soprano Martha Wright who agreed to produce the first opera and later became its president. For seven years, the company used diverse performance spaces until getting its permanent home in 1979, at the Maryland Hall for the Creative Arts. The company produces two major shows a year, special operas for children and lectures to the community. The Annual Vocal Competition, free to the public, is a prestigious two-day event recognizing young artists in the Mid-Atlantic region. 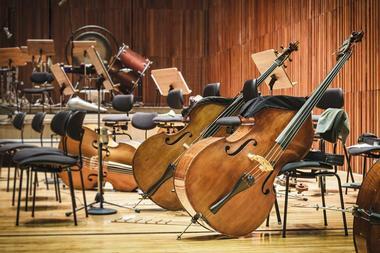 Since its renovation, the acoustics go out into the audience, not just to the stage. 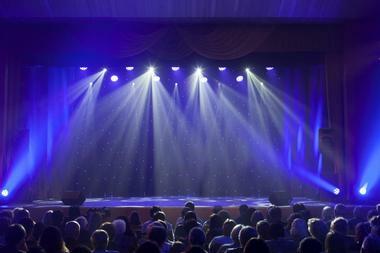 The space is intimate, giving performers a chance to connect with the audience. 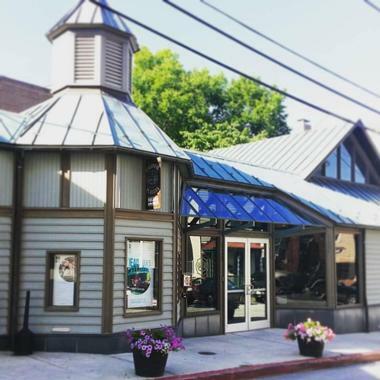 Founded in 1949, in the heart of downtown Annapolis, the Colonial Players is a community theater offering a wide array of dramatic productions ranging from comedies, musicals and dramas, to children’s theatre, workshops, one-act play festivals, and their annual production of A Christmas Carol. They also offer experimental theater and works by new playwrights. Their mission has always been to entertain, instruct and enrich the community by the dramatic arts. These goals continue to thrive as the theatre maintains a small army of volunteers and subscribers. In 1955, Colonial Players purchased an old car repair shop, their current location, and in 1989, expanded to include space for props, costumes, rehearsals and administration. All activities are open to the public, as they have been for half a century. Come learn and see how the middle-class in Annapolis lived in the 19th century. Hogshead is one of the very few remaining gambrel-roofed buildings in the area. Beginning in April 1777, recruits to the Continental Army were placed in these inexpensive rentals throughout Annapolis. They generally stayed just a few days or weeks. In the late 1960s, Historic Annapolis, the State of Maryland and Housing of Urban Development participated together in renovating Hogshead. Much of the original framing remains, but the siding and roof were replaced. The second story has the original flooring, partition walls and trim. The cellar was filled in, but it was re-excavated to show a brick floor, a large fireplace and a beehive oven. Hogshead is open on weekends, March to December. Admission is free; donations are welcome. Tucked among several government office buildings, including the Department of Natural Resources, this garden is named for Mrs. J. Millard Tawes, former first lady of Maryland, from 1959-1967. This 5 acre stretch of greenery is perfect for strolling and discovery, or for relaxing and contemplating. 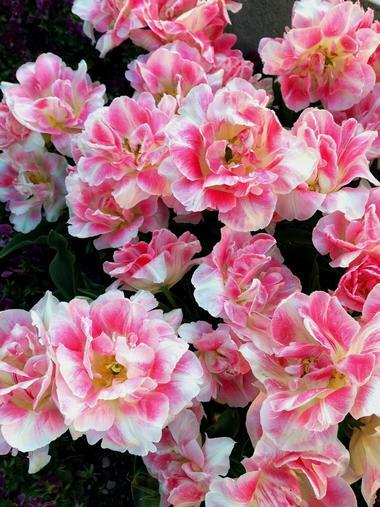 The garden is situated near the Western Maryland forest, an Eastern Shore peninsula, a stream and several ponds, raised planters and cultivated plantings. Guided tours are free, with a reservation, and the park is open daily, from dawn to dusk. The cafeteria and gift shops are also open daily. 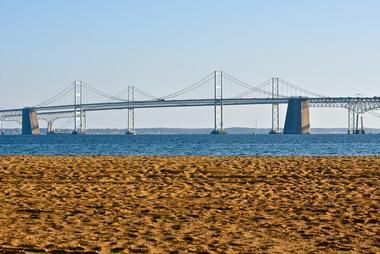 Sandy Point State Park is a 786 acre Maryland State Park, located along the Northwestern shore of the Chesapeake Bay. The park is open daily for fishing, boating, swimming, hiking and biking, as well as for bird watching, one of its highlights due to its enormous variety of waterfowl. Part of the beach has lifeguards and a bathhouse, restrooms and showers, with grills and picnic tables nearby. Nine sheltered areas, two for 160 people and one for 300 people, can be reserved for gatherings. Fishing and crabbing are permitted on the park’s pier, and supplies can be obtained at the marina store. The marina has 22 slips to launch your boat and a small-craft launch site for smaller vessels. There are four miles of hiking trails. The Baltimore & Annapolis Trail is a paved, 13-mile trail, brimming with history, which follows the route of the Annapolis and Baltimore Short Line Railroad. Today, the 112-acre linear area goes through parks, neighborhoods and wooded areas. The Planet Walk is a museum along the trail concerning the sun and each planet. Sponsored by NASA, the planets are true-to-scale. There are several small parks on the trail, with historical markers from A to Z. A is the Winchester Station House near Annapolis, the start of the trail. At mile 13.3 is the Z marker, for the Sawmill Branch, the source for local water power in the early 18th century. The trail ends in the small town of Glen Burnie. For a classic, family-owned sailing experience, choose the Woodwind and Woodwind II. These two beautiful 74-foot schooners are available for 2-hour Public Sailing Cruises, Private Cruises, Schooner Races, Boat & Breakfast Runs, Student Groups, Wine, Beer & Food Events, and for Multi-Day Cruises. 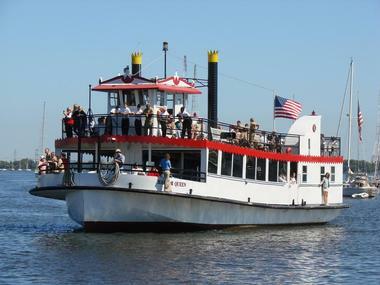 Help raise the sails if you wish or simply relax and enjoy a memorable breakfast as it sails past the Naval Academy and cruises into the Chesapeake Bay. Woodwind and Woodwind II participate in match races every Wednesday night when there is an Annapolis Yacht Club Race. Passengers, otherwise known as guest crew, may participate; this is America’s Cup-style racing. 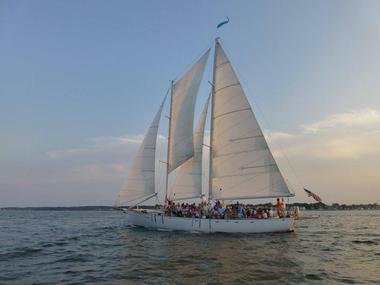 Every October, Woodwind races down the Chesapeake Bay to Portsmouth, Virginia with a guest crew for a 130-mile sail, taking as little as 12 hours or as much as 40 hours to complete. Almost everything in this Market, known locally as the “Amish Market,” is made in Lancaster County, using traditional recipes that have been handed down through generations. A large selection of foods including fresh produce, salads, candy, desserts, cheeses, homemade snacks, chemical-free meats, chicken, as well as foods in bulk can be purchased here. The market is located at the Annapolis Harbor Center, and the Amish merchants here are from Lancaster County, the heart of Amish country. 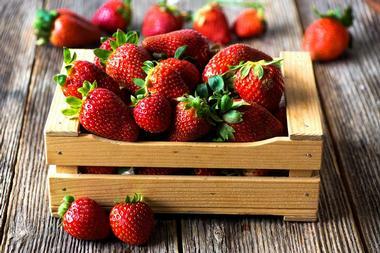 You may order small portions to eat while there, or larger portions to take home. The Dutch Market Restaurant has complete menus for breakfast, lunch and dinner, prepared by Amish cooks, using only traditional recipes. Also, the Millwood Furniture store sells a full selection of handmade solid hardwood furniture for guests to take home. The Bay’s largest private fleet is owned by Watermark, a family-run business dedicated to immersion in the cultural life, fun and history of the Bay. Watermarks’ skilled event planners are part of the crew and provide edifying walking tours, Water Taxi rides, corporate, group or personal yachting excursions, wedding receptions on a yacht or any imaginable event. A walking tour is the perfect way to follow the footsteps of George Washington and other signatories of the Declaration of Independence. Take a cruise around the Bay’s lighthouses, or learn about the city’s maritime culture. Well-behaved dogs on leashes are always welcome at no charge. A Water Taxi is a fun, convenient and affordable way to see the sights. Operated by Watermark, the Water Taxi fleet provide daily weather-dependent service. With the Museum at the waterfront, one can learn how to harvest oysters or how to climb a workboat. Sailing and boating are the key to Annapolis’s modern identity and can be learned about and explored at the Museum. 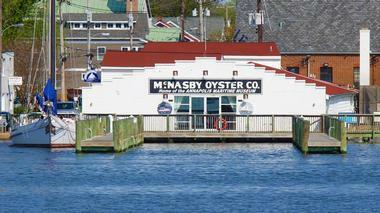 The Annapolis Maritime Museum is just across from the Naval Academy, sharing the area’s maritime history. As the State of Maryland’s official museum of African American heritage, the Banneker-Douglass Museum documents and promotes African American culture and history by providing exhibitions and programs to increase the understanding and appreciation of this rich cultural diversity. The Banneker-Douglass Museum is part of the Maryland Commission on African American History and Culture. 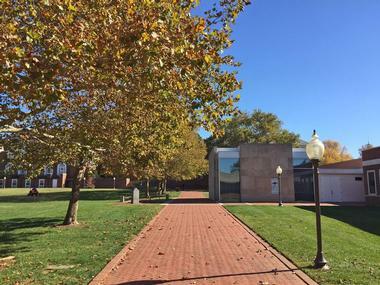 The Sylvia Gaither Garrison Library, named in honor of its first librarian, uses multiple resources to document Maryland’s African American heritage. It is contained within the Banneker-Douglass Museum. As a retrospective, the collection’s specialty is books, maps and periodicals from the late 1960s to the 1980s. This library uses audio-visual materials, and numerous other forms of research. The Sylvia Gaither Garrison Library has an African American rare books and manuscripts collection, ranging from the 1780s to the 1970s. Free self-guided tours are available. This 8 foot statue of Thurgood Marshall as a young man stands as a testament to Baltimore native Thurgood Marshall. In 1967, Marshall became the first African American Supreme Court Justice of the United States, and a more fitting place for this statue cannot exist. Located at State House Square, on Lawyer’s Mall, in almost the exact spot where the Maryland Court of Appeals once stood in 1935, is where Marshall argued the Murray case before that court, using many of these same arguments to win Brown v. the Board of Education. Behind him, pillars read "Equal Justice Under Law,” and facing him are two benches. One has the figure of Donald Gaines Murray, accepted into the University of Maryland Law School, representing Marshall’s efforts in winning the civil rights case of Murray v. Pearson. The other bench has two children, representing Marshall's most important achievement, Brown v. The Board of Education. Originally built in the 1770s by Samuel Chase and later owned by Edward Lloyd IV, the house changed hands many times before being left to Hester Chase Ridout. When Ridout died, it was written in her will that the home would now operate as an independent living facility for elderly women, which it still does to this today. The Chase Lloyd House is famous for its elaborate decorative moldings and its plaster-work. Samuel Chase, the original owner, sold it unfinished to Edward Lloyd IV who hired William Buckland to finish the interior. Buckland continued the perfect Georgian symmetry on the inside, and finished it in 1774. 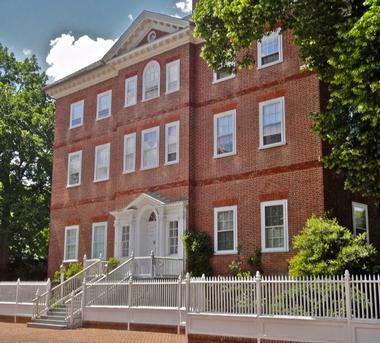 The Chase-Lloyd House is one of the last of its kind to be built in Annapolis. Samuel Chase was not only a signatory of the Declaration of Independence, but he was appointed to the Supreme Court by George Washington, where he remained until his death in 1811. This beautifully furnished 18th century historic mansion is open for tours Monday through Saturday from 2 - 4 pm.